This is just so darn sensible I wish I had one in every room of my home! Each time I stomp around the house turning light switches off I remember my dad grumpily doing a similar thing when I was little. 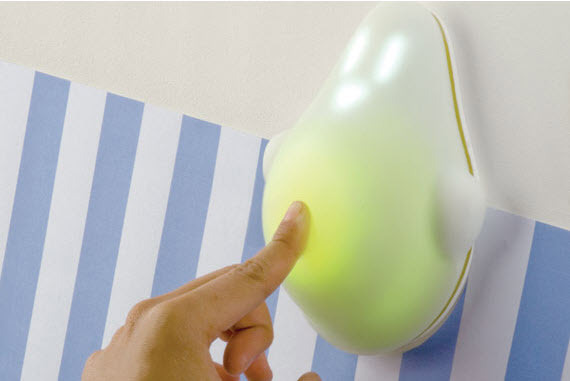 Designer Tim Holley’s Tio Ghost is a wall-mounted light switch system that enables children to take charge when it comes to turning off lights and being aware of energy conservation. The simple system works like this – when Tio is happy he is green, indicating that the lights have only been on for a short amount of time. The longer the lights are left on, the angrier Tio gets and the redder he becomes. I like his cross little scowl when the lights have been left on way too long. There is another element to Tio: information is sent from the wall switch to your computer, allowing children to track information about light usage and look after a ‘virtual tree’ by moderating their energy usage. The Tio system’s cause and effect approach is both engaging and educational for children. Tio was developed as part of an energy conservation initiative. Check out Holley’s other inventions including the Penguin Journal, the Tubby Click Click and the BreakFAST Bowl.